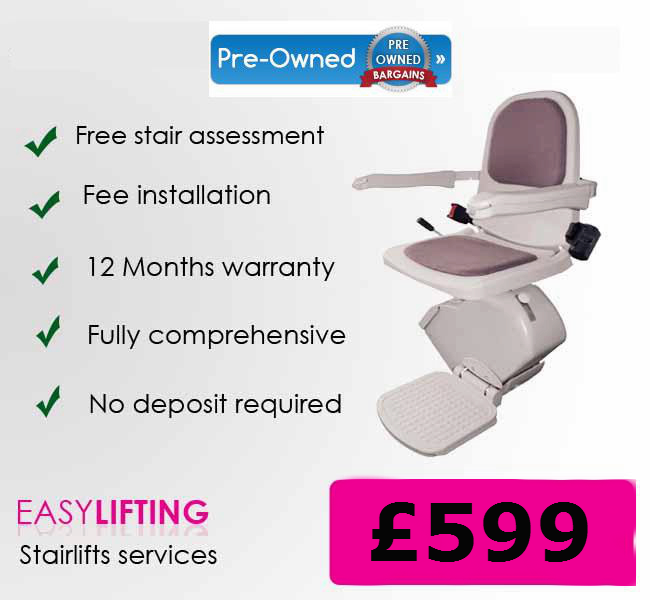 Buy A Reconditioned “Used” Stairlift Fully Refurbished To Be As Good As New! 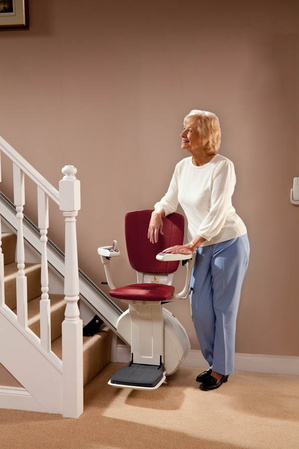 Huge savings can be made with our refurbished stairlifts. The majority of these stairlifts virtually unused! Our team of technical engineers have fully restored and refurbished these stairlifts to their original factory condition and ensured that all the vital accessories are present and correct. All our reconditioned stair lifts have been manufactured in uk, and great care has been taken to ensure the safety of the user and the lift before we send it out for installation, With the 12 months warranty as a minimum contract including the the price. it give you a peace of mind, it covers the free replacements of parts, call outs, and labour. We supply and install allover the northwest and west yorkshire including Manchester,liverpool, blackpool, southport,preston, bradford, Leedsand manymore. 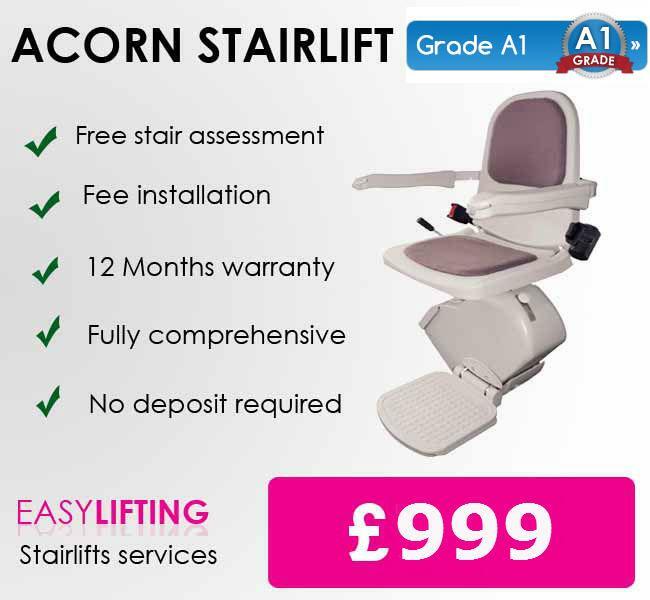 • Padded seat and backrest Ensures that the Acorn Stairlift gives the most comfortable ride available. • Easy to operate, even by those with limited dexterity. • Folding arms, seat and footrest. • Slimline fold-away design allows easy access to the staircase. 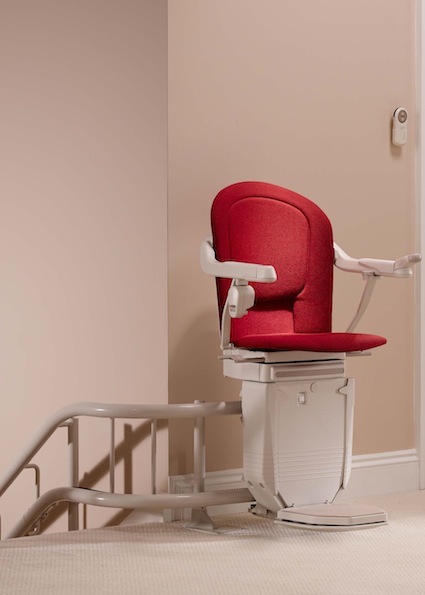 • Lockable swivel seat allows the user to safely board and leave the lift without the need for twisting the body. • The Acorn 120 fixes quickly and easily to your staircase, so there’s no mess, and no need for any repairs. • Allows the user to prevent others from using the lift. • Informs the user of the status of the stairlift. No-obligation stair assessment, Installation, 1 Year warranty 24/7 Call out. Parts, Labour, ALL FOR THE PRICE YOU SEE . Please contact us within 14 days If you are not entirely happy with your purchase and we will arrange collection of your item and we will give you full refund. 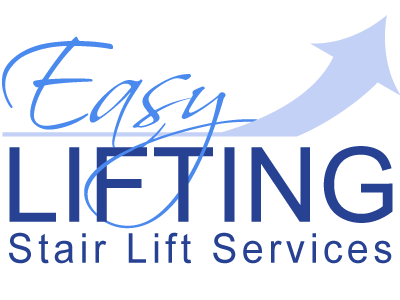 All purchases from Easy lifting are protected which give you the right to cancel the purchase within 14 days after the day you receive the item.